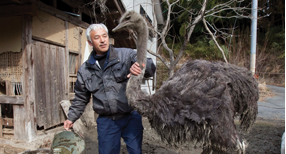 Synopsis: Two years since the Fukushima Dajichi Nuclear Power Plant went into full meltdown, and the resulting 20 km evacuation zone was enforced, one farmer still remains behind braving high levels of radiation and loneliness to tend to abandoned animals. His name is Naoto Matsumura, and he is the last man standing in the ghost town of Tomioka. Another farmer, Kenji Hasegawa's town of lidate was also evacuated due to high level of radiation; he sought refuge in temporary housing. Faced with a post-nuclear world, both these men share brutally honest views on the state of their lives, TEPCO, government inaction and some of the hardest situations they have had to face in the midst of overwhelming radioactivity.